The historic and breathtakingly beautiful city of Budapest, capital of Hungary, is a European capital of the “right size”. With a population of close to 2 million, it offers all the delicacies and sophistication of much larger European capitals. It is an old city with Roman ruins and dramatic architecture, yet is also a very young one, with more and more new pubs, cafés, galleries, and a vibrant alternative scene. It is energetic, colourful, and foreigner-friendly. It is also physically very attractive, with the green hills of Buda overlooking historic Pest, across the river Danube. There is a palpable sense of "cool" emerging in Budapest with the city's history and architecture as a dramatic backdrop. 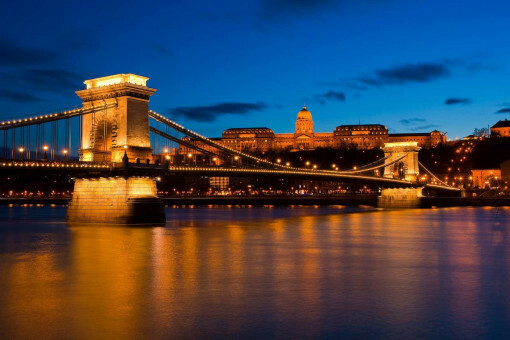 Budapest offers a wonderful equilibrium of the slow pace of the remote Europe of the past and of a hectic cosmopolitan metropolis, home to one of the strangest languages of the world. The Liszt Academy itself is located in the very centre of the city, only blocks away from the Opera House and the best theatres, amidst stylish cafés and restaurants pulsing with life. The city offers a huge variety of cultural activities, and the students of the Liszt Academy have limitless opportunities to attend concerts free of charge or for a token charge in the gorgeous concert halls of The Liszt Academy, the Opera House, the brand new Palace of Arts and in other smaller, but equally attractive venues around the city. Here we tried to collect some information that could be of help to you to feel more at home when you are establishing your life in Budapest. Should you have further questions, you are welcome to turn to the Students' Union (www.lfzehok.hu, click on 'International'). If you wish to read a real, personal and funny insider's city guide, we recommend you András Török's Budapest: A Critical Guide, and a website by the same author: http://www.budapest-criticalguide.hu/ . International students are all amazed by the pulsing concert life they find in Budapest. You will be attending an institution that is the flagship of Hungarian musical education, and the most prestigious concert venue of Budapest. Students of the Liszt Academy have free access to the concerts in the building, the place held for students is on the 2nd floor ("Kakasülő"). The Palace of Arts was opened to the public in 2005. It houses the Bartók Concert Hall, equipped with the latest state-of-the-art technology. It has all the attributes that are needed in a true flagship cultural centre: huge spaces, the latest technology in everything, a good location and marvellous architecture. Students of the Liszt Academy may purchase tickets for a token price. Budapest is a city with a fine theatre tradition, even if nowadays the money to stage more elaborate productions is in short supply. International musicals, together with long established domestic shows make up the vast majority of what's staged here, although alternative productions (including some fairly radical offerings from around the world) also have a firm footing at smaller, fringe venues. Budapest is proud of possessing one of the most beautiful opera houses in the world. The opening performance of the Opera House was held in the neo-Renaissance building, the jewel of the Andrássy avenue, in 1884 after nine years of construction. The first director was Ferenc Erkel, Gustav Mahler held this post for several years, and Puccini directed the premiere of two of his operas here. Renowned guest conductors include Otto Klemperer, Sergio Failoni and Lamberto Gardelli. It is still one of the best opera houses in Europe ( www.opera.hu ). Students of the Liszt Academy may ask for the free opera season ticket at the office of the Students' Union. if they witsh to see a performance The ticket has to be returned the day after. Budapest's larger theatres are mostly early 20th century affairs, many of which have been renovated over the last ten years or so. If you're interested in the architecture just as much as the performances, then Budapest's most famous theatre - the Vigszinház (comedy theatre) - is perhaps the best place to take in a show. For performance listings check out Pesti Est or Pesti Müsor, or the pages of www.theatre.org.hu for individual theatre (and theatre company) websites. Although most are in Hungarian, it's fairly easy to work out what's on and where. Alternatively, Budapest Week carries reviews for new shows which hit town. Curtain up for most theatres is 7-8pm, while it's obligatory - almost everywhere - to check your coat before taking your seat. The huge Neo-Classical building of the Museum of Fine Arts dominates not only Heroes' Square, but Budapest's cultural life. The permanent exhibitions boast Italian, Egyptian, Roman, Spanish and Greek exhibits, of which the Italian is said to be the most comprehensive (with a survey of the various schools from the 12th to the 18th centuries). The Spanish collection is simply the second largest collection of Spanish art outside of Spain, including no fewer than 7 masterpieces by El Greco. The Hungarian House of Photography (1065, Nagymező utca 20, District 6. – 5 minutes from the Liszt Academy), uniquely in Europe, was built for the purpose of exhibiting photography. A multi-storey building under historical monument protection, its primary task is to give home to Hungarian and international historical and contemporary photographical exhibitions. The Hungarian National Gellery (1014, Szent György tér 2, District 1.) museum is located inside the Royal Buda Castle building containing over 100,000 items, it is by far the largest public collection featuring the evolution of Hungarian fine arts. Ludwig Museum - Museum of the Contemporary Art (1095, Komor Marcell utca 1, District 9 ). The museum's main theme is universal art from the past 50 years and Hungarian contemporary art from the past 10 years. It is located in the building of Palace of Arts. Those who crave for the popular movies may find the best - and most expensive - places in commercial centers, such as Westend or Duna Plaza. These cinemas offer the greatest sound and picture available nowadays. Also, we should not forget Corvin, which is probably the last high-quality movie theater outside the plazas (and the only one with a history of successful innovation in the early 90's). In the beginning of the new millennium, many cinemas in Budapest closed and no longer are in operation. Those of the remaining few which managed to "evolve", offer decent services for a somewhat lower price, and often a wider variety of movies. Kossuth is a good example, where the atmosphere of the earlier Hungarian theaters meets modern technology, and where you can see less popular films as well, those which could not make it to bigger theaters. And last, but most definitely not least, there are the "art" cinemas. For the lack of technology, they make up with a unique atmosphere, the possibility to meet other art-movie fans and discuss films with them, and facilities to accommodate such discussions (e.g. coffee shops). Although Budapest is not a movie capital, you can still find the place to your taste to spend an evening watching your favorite film. You can find more information about cultural events in Budapest also at www.budapest.com. Budapest has many bookstands on the streets and a number of larger bookstores. While the street stands mostly offer dime novels, and the smaller shops usually specialize in a particular field (e.g. technical, music, etc. ), the bigger stores have a wide variety of foreign language books. The largest bookstore in Hungary is the Alexandra Bookhouse, with a store on the Nyugati square – two tram stop from the Liszt Academy, it is open late into the night. Although it feels a bit unorganized, at least all the books in foreign languages can be found together. If you cannot find what you are looking for here, your next bet would be the Libri store on Rákóczi street, between Astoria and Blaha Lujza square. This shop focuses less on dime novels, and more on technical and political literature, with a wide selection of foreign language books. If you cannot find the book you are looking for in either of these places, there are a few foreign language bookstores throughout the city, the most well-known is probably the British one in Váci street. If you need to buy scores or books of musical relevance, the best place to go is Rózsavölgyi Zeneműbolt in District 5 on Szervita tér – close to the Deák tér or Vörösmarty tér stops of the metro. Hungarian is one of the small number of modern European languages that do not belong to any of the large language families and often sounds and looks completely different to speakers of other languages. Despite the fact that most young Hungarians speak at least basic English, many ticket controllers, shop assistants, and other people a foreigner might meet still cannot respond properly - or in worse cases, respond at all. There is hardly a solution, but those students who wish to learn Hungarian may attend courses provided by the Liszt Academy.